@MonkeysAndBirds (cont) Of the 25 macaques, about 10 of them have no names (only lab numbers tattooed across their chest, so we need good monkey names. I tweeted Stephen and submitted a name. I was lucky that the name was actually picked! Meet #29209. Actually meet Kera. Kera is about 4 years old and judging from the pictures Stephen sent me, it looks like he really likes grapes! I chose "Kera" because the word kera means monkey in Malay. Me and long-tailed macaques go a long way. Most don't know that it's these macaques that inspired me to be a primatologist when I was just a wee kid. Watching them groom each other peaked my interest in primates. Anyways, not only did I named him, I actually sponsored him! For a small amount of $10.00 per month, you can sponsor one of these macaques as well. Here's a list of the macaques that now resides at Primarily Primates. Right now, 7 8 out of 25 macaques have been sponsored. If you are interested in sponsoring one of these macaques (and I hope you do! ), you can do so at Primarily Primate's website. Stephen told me that you can also email him with any questions at stephentello AT gmail.com. For more about the macaques and the journey to the sanctuaries, read the article A Journey of 1,700 Miles, From Toxic Tests to Sanctuary. Four Stone Hearth #97 is currently being hosted over at Zenobia: Empress of the East. 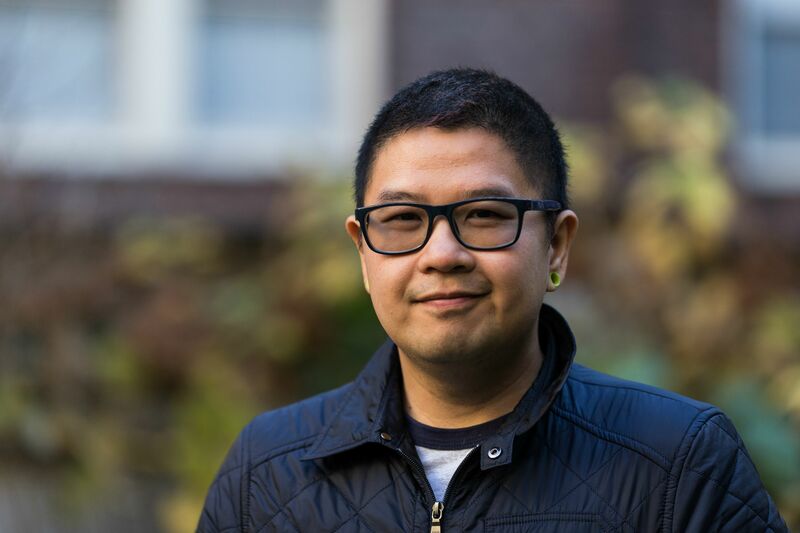 Head over to the blog and check out some of the best Anthropological blog posts and hopefully you'll bookmark/RSS feed these blogs! After you are done reading Four Stone Hearth #97, please email your submission to me for the next edition. The next Four Stone Hearth (#98) will be held on Wednesday, August 4th here at The Prancing Papio. If you would like to submit content to the next issue of the carnival, please write to the keeper of the blog in question or to Martin. You are encouraged to submit other bloggers' work as well as your own. Can we really take into accounts early observations and writings of non "scholarly" works when it comes to the study of animals? Should we ignore written observations of animals behaviors and ecology if it wasn't written by an academic in a scholarly manner? A paper I found recently details the early work of an Italian army officer named Luigi Fossati and his observations on hamadryas baboons in Eritrea, Africa. In their paper, Luigi Fossati: A forgotten early primatologist and his observations on hamadryas baboons (Papio hamadryas) in Eritrea, Gippoliti and Majolo (2006) described some of Fossati's observations and compared them with what is currently known on hamadryas baboons. But before that, here's a little bit about Fossati. Eritrea, in relations to other African countries. Luigi Fossati was an Italian army officer that spent a few year in Eritrea in the 1920's (Eritrea was an Italian colony until the Second World War). Before he went to Eritrea, he already had a strong interest in animals, ranging from the interactions between different animal species and behaviors of lesser known mammal species of that time. Upon returning to Italy in late 1920's, he published several books and papers on hunting and on the behaviors of various Eritrean mammals and birds. The first six chapter of Fossati's (1930) book, Uod Baracà (figli selvage) ed altre storie id bestie selvagge dell'Eritrea, is about his observations on hamadryas baboons in Eritrea. In this presumably early primatological field work, Fossati's observation was done on Mt. Gaab in the Aidereso Valley, near Asmara. Although I can't get my hands on Fossati's book nor am I able to read Italian, Gippoliti and Majolo's paper (2006) comes in handy. They compared some of Fossati's observations to what we currently know about hamadryas baboons and hoped that Fossati's work will be recognized by the scientific community and be considered one of the first field primatologists. Adult hamadryas males often interact with and protect juveniles and infants. Contemporary studies show that these male-infant relationship tend to reduce the risk of infanticide by other males, reduce agonistic male-male interactions and favor female mate choice (females more likely to mate with males that has strong male-infant relationships). Males move to new groups when they reach adulthood while females stay in their own group. He observed dispersing males acquire females from the older males of the same or different bands to form new "families" (one male unit) but before doing so, these males may spend a long period of time alone. Fossati's observation on the pattern of dispersion can be supported in contemporary literature. It is interesting to note that while females have been observed moving from one group to another, they only do so within the same band. Some females, however, are kidnapped into a different band by adult males (which is not a true dispersal). Studies have shown that dispersion significantly increase mortality rate. Interspecies association between a solitary male baboon and vervet monkeys (Chlorocebus aethiops). Fossati observed that the dispersing baboon followed a group of vervet monkeys for a few days and spending a close distance with them. He hypothesized that such association was mainly due to predator avoidance, using these vervet monkeys to increase the chance to detect predator. Response to various predators in different ways according to the type of predator present. He also observed that the baboons responded appropriately to alarm calls given by other species. 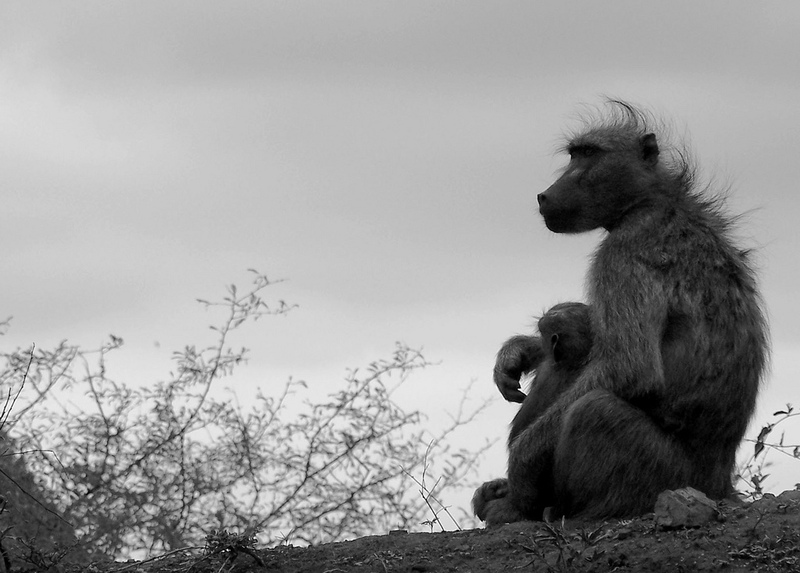 Recent studies show that hamadryas baboons have a relatively limited range calls. These baboons not only listen to alarm calls from their conspecific but also from other species. Reported the first written account of predation of a juvenile baboon from a Verreaux's eagle (Aquila verreauxii). The first description of the Verreaux's eagle as a potential predator of baboons was published in a scientific journal 70 years after Fossati's published work by Zinner and Pelàez (1999). Fossati was clearly able to identify and document the behaviors of hamadryas baboons in Eritrea while he was stationed there in 1920's. Gippoliti and Majolo brought up convincing reasons why Fossati's work should be recognized as one of the early primatologists. I think we should re-evaluate how we do research by not only cite "famous" works but to cite any relevant publications out there. I do agree with Gippoliti and Majolo on the importance of early observations that are conducted when human impact on habitat characteristics was minor or irrelevant. NOTE: A copy of Luigi Fossati: a forgotten early primatologist and his observations on Hamadryas Baboons (Papio Hamadryas) in Eritrea (Gippoliti & Majolo; 2006) can be obtained by clicking on this link and requesting it from the University's website. The paper FREE to view but due to restrictions imposed by the publisher, I cannot attach the paper in this blog. Gippoliti, S. Majolo, B. 2006. Luigi Fossati: a forgotten early primatologist and his observations on Hamadryas Baboons (Papio Hamadryas) in Eritrea. Ethology, Ecology and Evolution 18 (1): 69-72. Although Primatology is mainly defined as the scientific study of primates, the definition itself is admittedly broad. Without a doubt, ardent readers of The Prancing Papio know what Primatology is but would you rather define Primatology in a much more descriptive manner? I am for the broad definition of Primatology although it is somewhat vague. I mean, what's easier than to tell people you study primates right? Of course there are times when you actually have to explain what primates are. Anyway, I found what Erwin addresses in his paper rings true with The Prancing Papio. 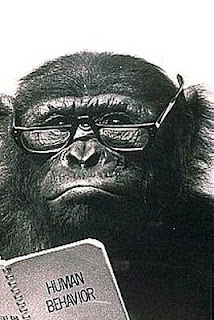 For awhile now, I've been trying to find a balance in this blog by blogging about a wide topic in Primatology while trying to avoid covering heavily on a certain area of study. However, "materials" seem to come in waves and there are times when I literally have nothing to write about. Sometimes I am left hitting the proverbial wall. Erwin, J. 1981. Breadth and Balance in Primatology. American Journal of Primatology 1:261-263. After reading an article from Psychology Today by Hal Herzog, it got me thinking about the idea of pet-keeping. The article "Are Humans The Only Animals That Keep Pets? ", claims that humans are the only animal that keeps members of other species for an extended point of time purely for enjoyment. Herzog points out that while some animals are documented having pets, this behavior almost always happen in captive or semi-captive environment where food and shelter are provided. The author believes that humans are "true" pet owners because the owner-pet relationship occurs in a natural setting and argues that animal pet owners are not "true" pet owners because they do so in captive or semi-captive settings. Thus, Herzog believes that humans are the only animals that keep pets. 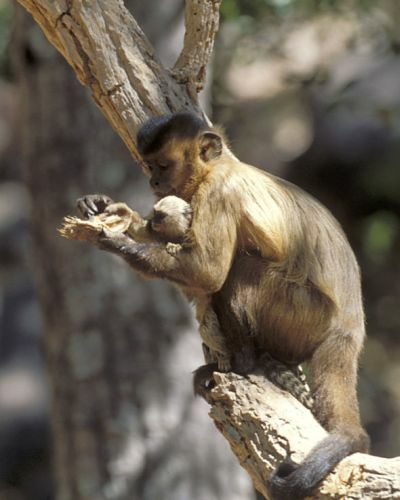 A young marmoset taking food (cracked palm nut) from its adoptive mother’s (capuchin) hand. Photo by Jeanne Shirley (Izar et al., 2006). What is a pet and how would you define one? Herzog (2010) defines a pet as a member of other species that are being kept for an extended period of time for enjoyment. According to the Merriam-Webster dictionary, the definition of a pet is "a domesticated animal kept for pleasure rather than utility". The definition of a pet in Oxford English Dictionary is "a domestic or tamed animal or bird kept for companionship or pleasure and treated with care and affection". Dr. James Serpell defines pet-keeping as a leisure activity but not necessarily without function, much like there are function in play or other recreational pursuits (Serpell, 1990). He thinks that pet-keeping is functional in a broad sense but not easily evaluable in economic terms. Some primate pet owners include (left) Koko and (right) Tonda, who both had cats as pets. While it is impossible to define what a pet is from an animal standpoint, at least in humans, we can agree that a pet can be defined as a companion animal that we treat with affection whose function is to provide us with enjoyment. Did the behavior of animal domestication evolved into pet-keeping? Is pet-keeping a reflection of human's nurturing instinct? Or is pet-keeping a reflection of human's constant need of social interaction, even outside of our own species? What do you think? Well ... that's for another blog post.